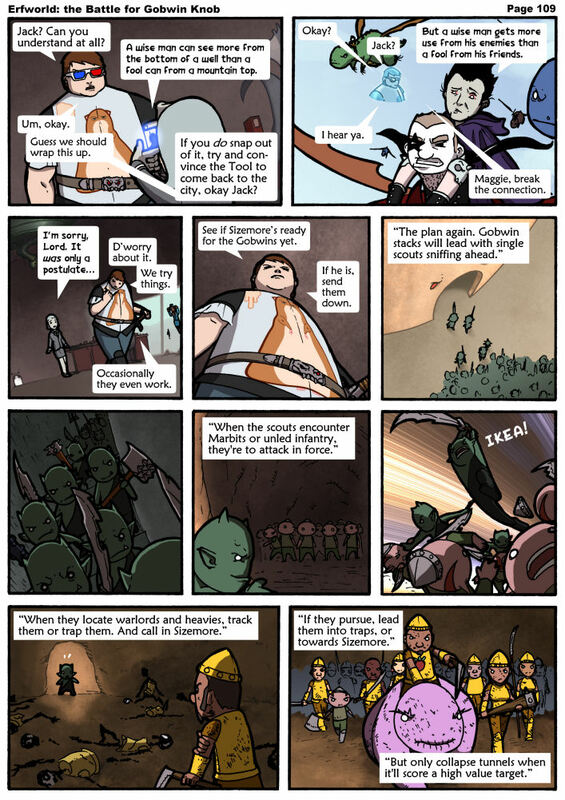 Combat in Erfworld can occur whenever one side's Units choose to attack a second Side's Units that are in the same hex or zone. A Side's Units may be grouped into Stacks, or may fight as single Unit. There is no limit to the number of Units that may stack together, though the bonuses gained from being in a stack max out at 8. Each Stack fights as a single entity, working together to perform a single task. Leaders perform the tasks of officers. Leaders may re-organize stacks in the vicinity, provide instructions to stacks, provide combat instructions to any units stacked with the leader, and provide a bonus to units in the same stack. Leaders are Casters, Warlords, Chief Warlords (all three unit types are also referred to as Commanders), and Rulers. For details on the effects of Special Abilities on stacking and force make-up, see Unit. Note that further use of "attacker" and "defender" is not appropriate in a Real-Time Combat system: it is only useful to determine if any combat is possible between two Units. Once combat has initiated, damage dealing is simultaneous for both Units. This calculation may be performed for both Units simultaneously, due to the real-time nature of the Combat system. When an attacker successfully gets in its "hitsies", it deals some amount of damage. This amount is subtracted from the Hits statistic of the defensive Unit. If the result is zero or less, the Unit is croaked. There may be a function, similar to the new D&D rules, where a unit must have negative hit points for it to be croaked, and otherwise is out of commission. The organization of a Side's forces are not restricted to a smaller hex grid inside the hex. With flight, units may be above or below each other, or do anything else they could on Earth, like climb on each other's shoulders. Units can perform any function a human on Earth would. Restrictive terrain may prevent combat between Units. See Movement for details on moving between hexes of different types. While combat is resolved based on the stats of the units involved, bonuses can have a large effect.Erf-b1-p125 Bonuses are cumulative, so it is most effective to combine as many of them as possible. Bonuses apply to both Sides in combat. It is not known if they apply to just Attack or to Defense as well. In a Real-Time Combat system, there is no defender; however, in Erfworld, units that are not on Turn are restricted in their activities. Units not on Turn may attack only non-allies that enter the same hex: if the defending Unit declines to attack the Unit as it enters, it may not attack later. Bonuses may be applied to level, creating an effective level in the stack that alters all of the unit's statistics (Hits, Combat, Defense, and Loyalty). This of course would not alter the unit's actual level, but could manipulate the amount of experience they accrue. This page was last edited on 4 February 2016, at 22:21.